The thyroid gland contains two main types of cells: follicular cells that produce thyroxin and C cells that produce calcitonin. A thin fibrous capsule with blood vessels, lymphatics, and nerves, most prominent at the poles, encloses the thyroid. The histologic appearance of thyroid follicles and colloid varies greatly as a reflection of secretory activity. Variation in follicle size is common, with the larger follicles tending to be at the periphery of the gland ( Figure 1 ). Follicular epithelial lining ranges from flattened to cuboidal ( Figure 2 , Figure 3 , Figure 4 , and Figure 5 ). Active follicles are typically lined by more cuboidal epithelium ( Figure 4 and Figure 5 ) and may have resorption vacuoles at the interface of the epithelia and the colloid ( Figure 3 ). As mice age, their follicles become less active, more distended, and lined by flattened epithelium. Tinctorial variations in colloid are commonly seen. Figure 1. Thyroid gland - Normal in a female Harlan Sprague-Dawley rat from a chronic study. The smaller parathyroid gland, with closely packed cells, lies adjacent to the larger thyroid gland with variably sized, colloid-filled follicles and interspersed C-cells. Figure 2. 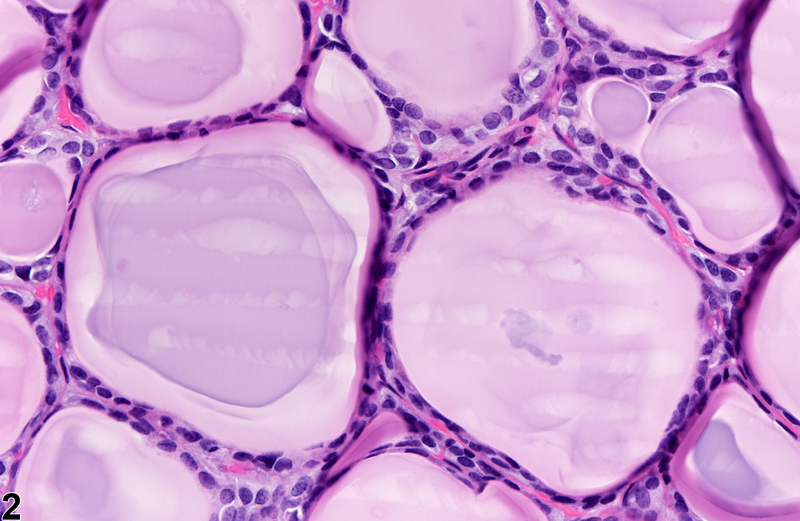 Thyroid gland - Normal in a female Harlan Sprague-Dawley rat from a chronic study.Higher magnification of the follicles with amphophilic to basophilic colloid and C-cells. Figure 3. 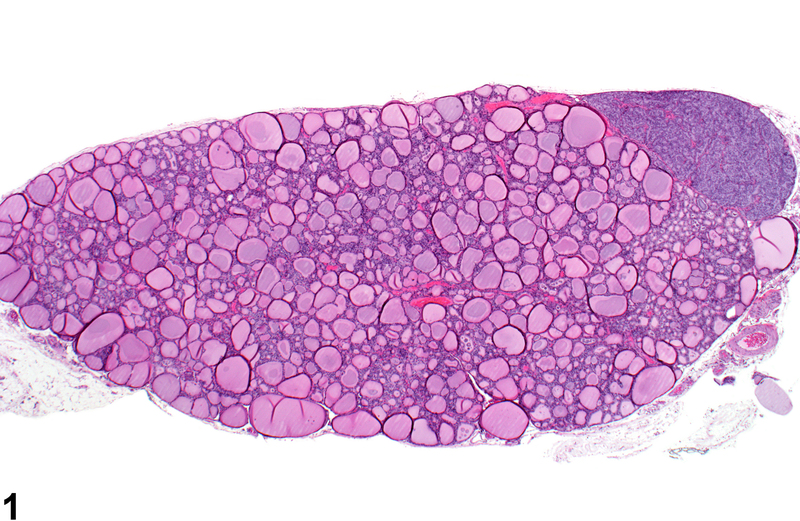 Thyroid gland - Normal in a female Tg.AC (FVB/N) hemizygous mouse from a subchronic study. 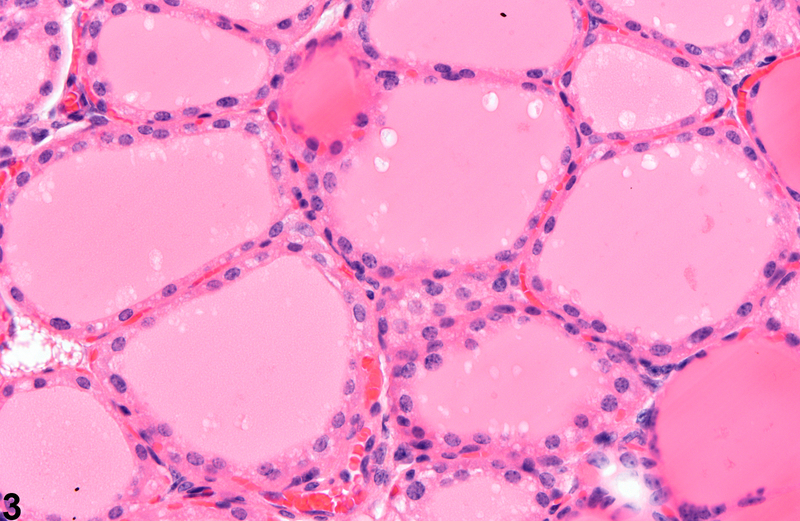 Another high magnification image of the thyroid follicles with eosinophilic colloid and peripheral resorption vacuoles. Figure 4. 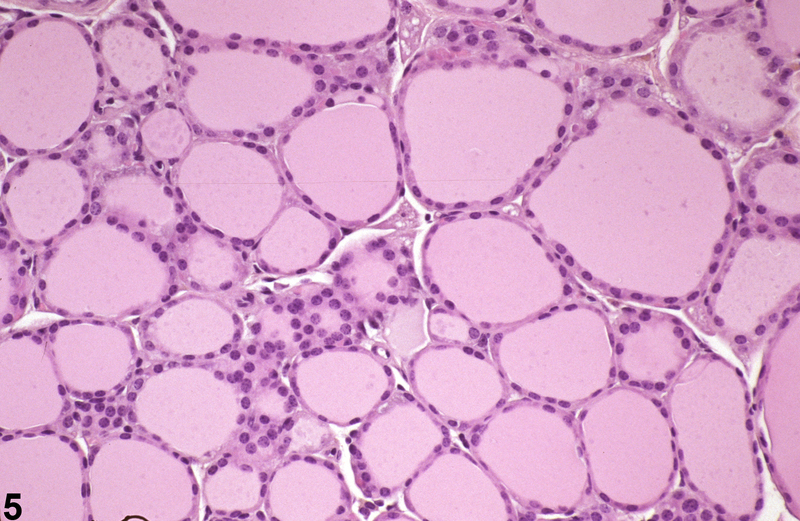 Thyroid gland - Normal in a male B6C3F1 mouse from a chronic study. 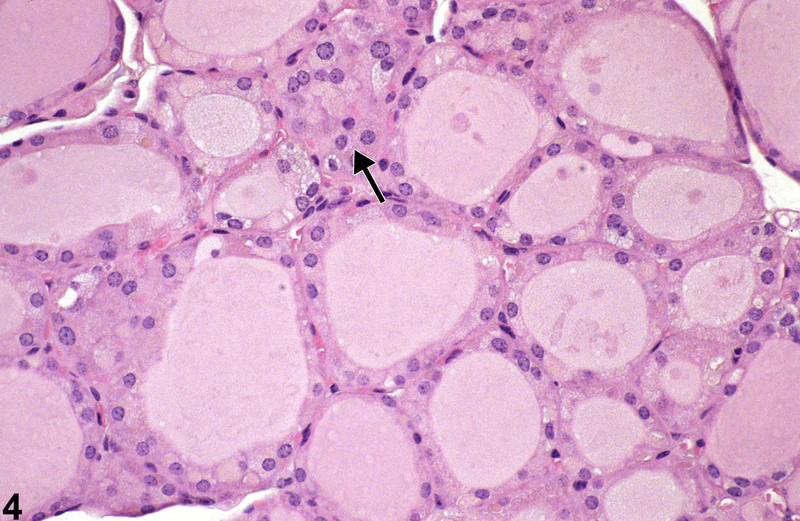 Thyroid follicles with a cluster of C-cells (arrow). Figure 5. Thyroid gland - Normal in a male B6C3F1 mouse from a chronic study. Variation in follicle size is a normal feature of thyroid glands in mice and rats. C cells occur singly or in small clusters and increase in number and prominence with age. C cells are readily identified in rats but not prominent in routine H&E sections of mouse thyroid. As a highly reactive organ, the thyroid may be a direct or indirect target of insult by many physical, chemical, or environmental agents. Since effects on the thyroid may be subtle or age related, it is important to assess changes with respect to concurrent age-matched controls. For common age-related changes, a diagnosis may not be necessary unless there is a potential treatment-related effect. Capen CC, DeLellis RA, Yarrington JT. 2002. Endocrine system. In: Handbook of Toxicologic Pathology, Vol 2 (Haschek WM, Rousseaux CG, Wallig MA, eds). Academic Press, New York, 681–783. Hardisty JF, Boorman GA. 1999. Thyroid and parathyroid glands. In: Pathology of the Mouse: Reference and Atlas (Maronpot RR, Boorman GA, Gaul BW, eds). Cache River Press, Vienna, IL, 537–554. Hardisty JF, Boorman GA. 1990. Thyroid gland. In: Pathology of the Fischer Rat: Reference and Atlas (Boorman GA, Eustis SL, Elwell MR, Montgomery CA, MacKenzie WF, eds). Academic Press, San Diego, 519–536.